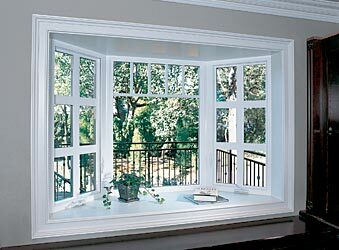 Bay windows project out beyond the exterior wall to create the illusion of a bigger interior. Typically used as a focal point in more formal rooms, bays are available with casements or single hung flankers for ventilation. Frame, Sloped Sill Adapter, and Flush Fin. standard with a full lifetime guarantee. Substantial 3-3/8" frame resembles wood window profile. Fusion-welded frame and sash permanently join the frame with no staples or nails. Milgard SunCoat® Low-E glass for superior energy savings and protection against fabric fading. Milgard Positive Action Locking System® for enhanced security and fingertip-easy opening. Available in either white or tan.